Yes, yes, you read that right. My never ending quest to incorporate tasty beverages into all the dishes we eat has led me to adding beer to our favorite summer BBQ side. Last week I saw that America’s Test Kitchen was having a “Dish it Your Way” Blogger Challenge, focusing on a different American classic dish each week. 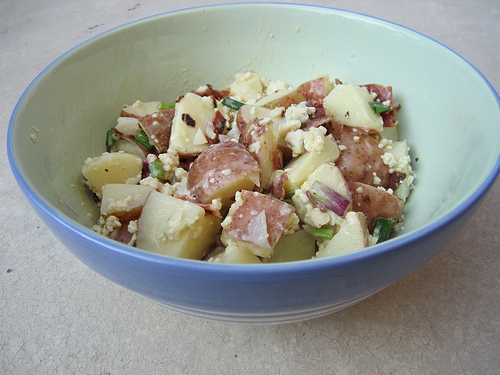 This week: potato salad. Within moments, the inspiration became clear. I knew what I had to do. Bacon. Blue cheese. Beer. Potatoes. These ingredients don’t just go together–they belong together. The fabulous thing about this recipe is flexibility. Want more bacon? Add more bacon. Not enough garlic? Add more garlic. Or add fresh, sauteed garlic. There is just enough mayonnaise to make the dressing slightly creamy, making it a little more dense so that it clings to the potatoes. And to those who don’t like spice: DON’T FEAR THE HOT SAUCE. You don’t have to add a lot. But let me tell you, until I added the hot sauce, the dressing was lacking. The hot sauce gave it a depth of flavor that wasn’t there before. And what I absolutely LOVE: you can taste the beer! I used Flying Dog Golden Ale: it’s crisp and clean and a nice neutral beer for this dish. But I would really like to try this recipe with an IPA, since they pair so well with both spice and blue cheese. If you experiment, let me know! We ate this salad warm, but I’m really looking forward to those leftovers. 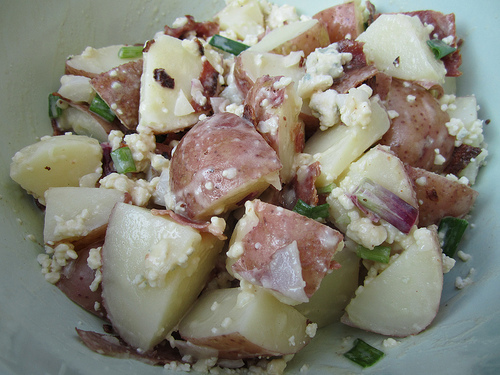 I bet the potatoes have absorbed all that delicious dressing…yum…My cookouts just got better. 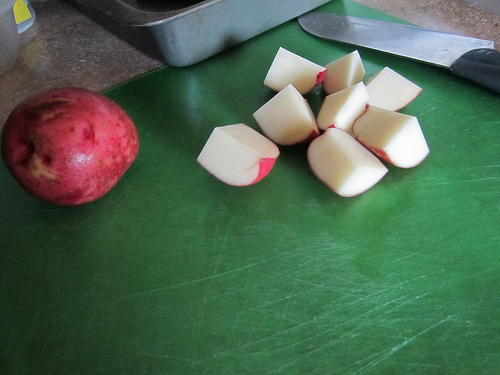 Wash potatoes and chop into bite size pieces. Place in a pot and cover with cold water. Bring to a boil and cook until the potatoes are fork tender. While you are waiting for the potatoes to come to a boil, cook the bacon and let cool. Chop your onion (use whites and greens) and bacon. 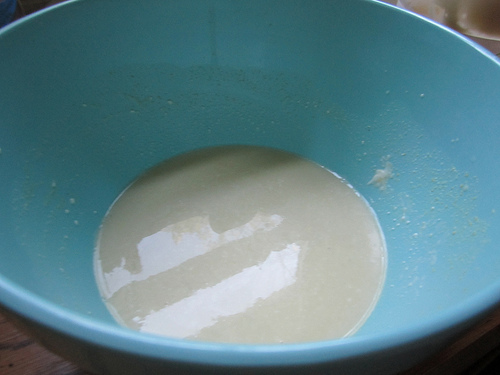 In the bottom of your serving bowl, combine beer, mayonnaise, mustard, garlic powder, and add hot sauce, salt and pepper to taste. When the potatoes are done, drain and add to the beer mixture. Add onions, bacon and blue cheese. Combine and serve.